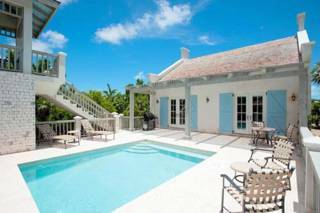 This tiny one bedroom and one bath cottage is located on the beach at Smith’s Reef at Turtle Cove. Additional features include a pool and a little lookout tower to watch the sunset from. Within walking distance of the shops and restaurants of the nearby marina. The pool at Nutmeg Cottage.